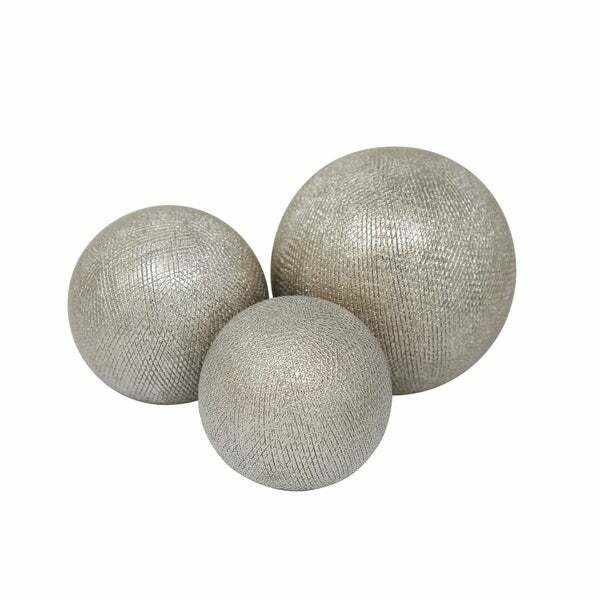 These champagne orbs would be a perfect decorative piece for you home. The shiny champagne colour adds bling to the piece. The three orbs are different in size going from smallest to largest. The champagne colour makes it appropriate for all kinds of decor styles. The textured pattern is embossed and can be felt with your hands. The grainy look adds to the piece?s appeal. You can keep the orbs on your side table or as a centre piece. This decorative piece would enhance your living space. The textured pattern is embossed and can be felt with your hands. Dimensions 6.0 In. X 6.0 In. X 6.0 In.